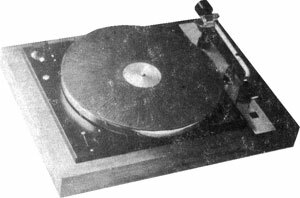 The Winco 4000 is a professional type turntable fitted with a hysteresis synchronous motor, which ensures speed constancy. The platter is made from heavy cast aluminium, perfectly balanced to reduce wow to a minimum. The platter rotates on nylon bearings, complemented by smooth, quiet operation this assembly also eliminates any problem of rumble. Explicit attention has been paid to details that will be appreciated by the connoisseur, such as noise suppression capacitor, placed in order to mitigate surges caused by power failure in circuits. Winco 4000 / 4000 owners manual, service manuals and schematics are for reference only and the Vinyl Engine bears no responsibility for errors or other inaccuracies. The PDF files are provided under strict licence. Reproduction without prior permission or for financial gain is strictly prohibited. This website is not affiliated with or sponsored by Winco.